Orlando Air Conditioning and Heating Service | REI Air | Are You Ready for Summer? AIr conditioning and heating systems are the single biggest energy user in your home. Take steps to make sure your unit is running as efficiently as possible to help offset cooling costs this summer. Inspect your air filter and change it if it's dirty. Plan to change your filter at least once per month, more often if you have pets. This keeps dust off the evaporator coil fins. Keeping your filter clean can cut energy consumption by 5-15%. Turn the unit off and let the fan stop before replacing the filter and insert the filter according to the manufacturer's directions. Clear away leaves, grass, weeds, plants,and other debris from around the outdoor condensing unit. Blocked airflow due to debris on the unit's fins will reduce its efficiency. You can also occasionally clean the outdoor unit by spraying it with a water hose. 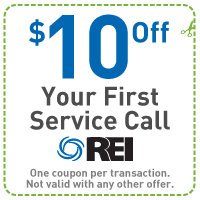 Call REI at 407.430.3879 to give your system a checkup.